Background: Psoriasis, an inflammatory disease of skin, shares many immunological features with other complex disorders such as cardiovascular disease, metabolic syndrome and depression. Metabolic syndrome is a cluster of risk factors including central obesity, atherogenic dyslipidaemia, hypertension and glucose intolerance. It is a strong predictor of cardiovascular diseases, diabetes and stroke. Aim: To investigate the prevalence of metabolic syndrome in patients with psoriasis. Methods: It was a prospective, hospital based case-control study of 60 patients with moderate to severe psoriasis having BSAI>10% and PASI>10 and 30 age matched controls having minor skin ailments. Venous samples were taken at the enrolment visit after the subjects had fasted overnight (at least 8 h). Serum cholesterol and triglycerides were measured with enzymatic procedures. Plasma glucose was measured using a glucose oxidase method. Metabolic syndrome was diagnosed by the presence of three or more criteria of the modified version of National Cholesterol Education Programme's Adult Panel III (ATP III). Statistical analysis of the data was done using statistical processing software (SPSS-17). Results: Psoriatic patients had mean disease duration of 8.16±8.30 years, mean BSAI was 41.88±15.803, mean PASI score was 17.606±6.831 and mean onset of age of psoriasis was 31.41±13.415. Metabolic syndrome was significantly more common in psoriatic patients than in controls [15 (25%) vs 1 (3.3%), odds ratio (OR) = 9.667, P<0.05]. Psoriatic patients also had a significantly higher prevalence of hypertriglyceridemia [26/60 (43.3%) vs. 4/30 (13.3%) odds ratio (OR) = 4.971; P<0.01] and arterial hypertension [28/60 (46.6%) vs. 4/30 (13.3%); P<0.01]. Conclusion: Psoriatic patients have a high prevalence of metabolic syndrome which can favour cardiovascular events. Psoriatic patients should be encouraged to correct aggressively their modifiable cardiovascular risk factors including metabolic syndrome. 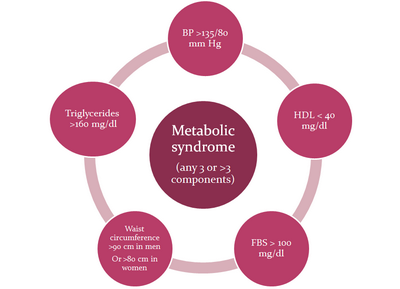 Fig 1: Various components of metabolic syndrome. The present study comprised of clinically diagnosed patients of psoriasis taken from Department of Dermatology, Govt. Medical College, Amritsar (INDIA). 1) Group I (Study Group): 60 clinically and histopathologically diagnosed patients of moderate to severe psoriasis having PASI score > 10 and body surface area index (BSAI) more than 10%. 2) Group II (Control Group): 30 patients attending Dermatology department with various minor ailments (age matched). The source population for cases and controls was the same. An informed consent was taken from all patients and patient characteristics were recorded on a standard proforma. Statistical analysis of the data was done using statistical processing software (SPSS-17). Relevant data included age, gender, weight, height, body mass index, waist circumference, blood pressure, smoking habit, age of onset and duration of psoriasis, type and severity of psoriasis. Body mass index (BMI) was calculated as weight in kilograms/height2 in meters. To determine waist circumference, we located the upper hip bone and placed the measuring tape at the level of the upper most part of the hip bone around the abdomen (ensuing the tape measure was horizontal). The tape measure was snug but did not cause compression on the skin. Blood pressure was recorded as the average of two measurements after subjects have been sitting for five minutes. Severity of psoriasis was assessed according to psoriasis area and severity index (PASI) and percent body surface area (%BSA) involvement. History of smoking and alcoholism was taken. The current smokers were considered to be those patients who had been smoking five or more cigarettes per day for minimum of five years. Patients consuming five or more drinks per day for minimum of five years were considered to be alcoholic in the present study. Metabolic syndrome was diagnosed by the presence of three or more of five criteria of the modified version of National Cholesterol Education Programs Adult Panel III (ATP III) [waist circumference >90 cm in men or >80 cm in women; hypertriglyceridemia >160 mg/dl; high density lipoprotein (HDL) cholesterol < 40 mg/dl; blood pressure >130/85 mmHg; fasting plasma glucose of > 100 mg/dl. Venous samples were taken after the patients had fasted overnight (at least 8 hours). Serum cholesterol and triglycerides were measured with enzymatic procedures. Plasma glucose was measured using a glucose oxidase method. The descriptive characteristics of study and control group are given in (Table 1). In the present study, majority of the psoriatic patients, i.e. 46 (76.6%) had PASI score 10 to 20 and 14 (23.2%) patients had PASI score of >20 including 4 (6.6%) patients with PASI >30 (Mean ±SD = 17.606±6.831) while 55 (91.7%) patients had more than 20% body surface area involvement and only 5 (8.3%) had Body Surface Area Involvement <20% (Mean ±SD = 41.88±15.803) (Fig. 2 and 3). 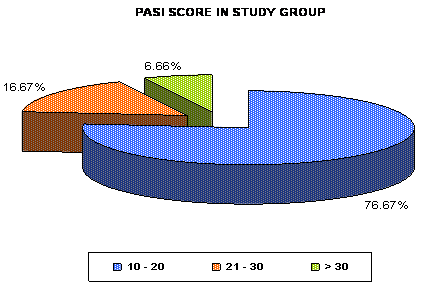 Fig 2: Distribution of number of psoriatic patients (in percentage) according to Psoriasis Area Severity Index (PASI) score in study group. 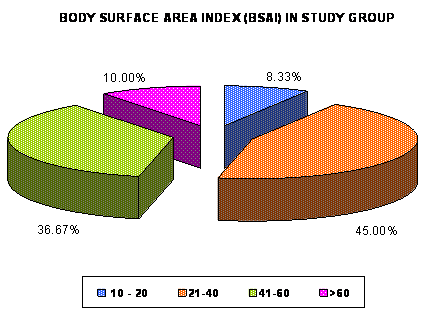 Fig 3: Distribution of number of psoriatic patients (in percentage) according to Body Surface Area index (BSAI) in study group. Maximum number of patients i.e. 17 (28.3%) were affected by the disease from 1-5 years while in only 6 (10%) patients, the duration of disease was >20 years and the duration of disease ranged from 20 days to 32 years (Mean ±SD = 8.16±8.30). Minimum age of onset of disease in this study was 12 years and maximum age of onset was 60 years (Mean ±SD = 31.41±13.415). While comparing risk factors in psoriasis patients and controls, 9 (15%) psoriatic patients were smokers while none was smoker in the control group and this difference was statistically significant (p-value<0.05). 23 (38.3%) patients in the study group were alcoholic as compared to only 2 (6.6%) patients of control group. This difference in two groups was also statistically significant [OR 5.595 (95% CI, 1.608-19.153), p-value<0.01]. (15/60= 25%) of psoriatic patients were found to have higher prevalence of metabolic syndrome as compared to controls i.e. 01/30 (3.3%) [OR= 9.667 (95% CI, 1.526 – 59.609), p< 0.05]. Individual components of metabolic syndrome like hypertriglyceredaemia and hypertension were also more prevalent in psoriasis patients than in controls. Hypertension was present in 28 (46.6%) patients in the study group as compared to 4 (13.3%) patients in control group [OR 5.688 (95% CI, 1.833-17.428), p-value<0.01]. Hypertriglyceridaemia was present in 26 (43.3%) patients in study group as compared to 4 (13.3%) patients in control group [OR 4.971 (95% CI, 1.60-15.248), p-value<0.01]. Decreased levels of HDL were present in 2 (3.3%) patients in study group as compared to none in control group. While comparing obesity by Body Mass Index (BMI), 32 (53.3%) psoriatic patients were obese as compared to 10 (16.6%) controls (p>0.05). By Waist Hip Ratio (WHR) criteria, 17 (28.3%) males and 13 (21.3%) females were obese in study group as compared to 4 (13.3%) males and 4 (13.3%) females in controls (p>0.05). By Waist Circumference (WC) criteria, 21 (35%) males in study group while in control group 6 (20%) males were obese (p>0.05) while only 14 (23.3%) females in study group and 4 (13.3%) females in controls were found to be obese (p-value<0.05). The prevalence of various components of metabolic syndrome in psoriatic cases and controls along with odds ratio and P value are given in [Table2]. 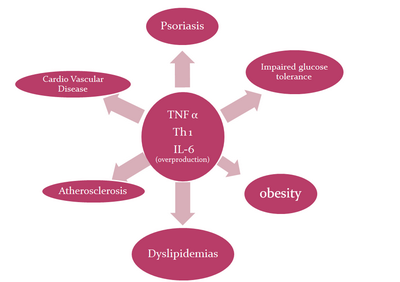 Fig 4: showing pro-inflammatory cytokines such as TNF-α, Th1 and IL-6 driven common pathway for pathogenesis of psoriasis and its comorbidities. Association of psoriasis with individual components of metabolic syndrome had been the focus of many cross-sectional studies in the recent past. Several studies with varying population and analytical approaches have found an association between psoriasis and increased prevalence of diagnosis of dyslipidemia. [17, 18, 19] In addition, multiple studies have documented increased prevalence of diabetes and hypertension in patients with psoriasis. [20,21,22] There have been different observations in different studies [Table 3]. In our study, 28(46.6%) patients were hypertensive as compared to 4 (13.3%) among controls (p<0.01). In one of the study by Henseler et al in 40,000 dermatological patients, it was found that there was 1.9 fold greater likelihood of hypertension in patients with psoriasis than the patients with other dermatological conditions. In another study by Kimhi O, it was found that patients of psoriasis had a significantly higher incidence of hypertension than controls. Similar results were also seen in our study where patients with psoriasis had 5.688 fold (CI 1.833-17.428) higher incidence of hypertension than controls. In a study by Nisa et al, it was found that 49.3% patients were hypertensive in study group while only 16% were hypertensive in control groups. In another study by Gisondi et al, 40.8% patients were hypertensive in study group and almost equal numbers of patients (39.5%) were hypertensive in control groups while Thomas et al observed 14.1% psoriatic patients to be hypertensive. Obesity is a pro inflammatory state and the adipose tissue is a rich source of inflammatory mediators as adipocytokines. Leptin, a protein hormone produced by adipose tissue that plays a key role in regulating energy intake and expenditure, is a stimulator of T cells, and in mouse models, leptin deficiency negates autoimmune pathophysiology, suggesting a potential link between adipose tissue and psoriatic inflammation. [12,23] TNF α induces the rapid release of leptin from adipocytes in culture & causes circulating leptin levels to increase in vivo. A study by Nisa et al showed a statistically insignificant difference among psoriatics vs. controls. 14.6% of the psoriatic patients were obese as compared to 20.6% of controls. Similar results were obtained by others [15, 22]. In our study 58.3% of patients were obese in study group as compared to 33.3% in control group though our findings were statistically non-significant. Alcoholism has been related with psoriasis. In our study 38.3% patients were alcoholic as compared to 10% in controls. In another study by Naldi et al, 215 newly diagnosed patients and 267 controls showed that risk for psoriasis was higher in alcoholics than in non-alcoholics. The increase in risk for the development of psoriasis was 1.3-fold (95%CI, 0.8–2.3) for patients who had one or two drinks per day and 1.6-fold (95% CI, 0.9–3.0) for patients who had three or more drinks per day. Pro-inflammatory cytokines like TNF-α and IL-6 which are over expressed in psoriasis are known to contribute to dyslipidaemia . Compared with the control subjects, patients with psoriasis are more likely to have abnormal lipid metabolism. Studies have demonstrated significantly higher level of S. Cholesterol, triglycerides and LDL in psoriasis as compared to control population. These patients also have significantly lower level of HDL than controls. Hypertriglyceridemia was seen in 43.3% cases as compared to 13.3% in controls in our study, i.e. OR 4.971 (CI 1.60-15.248 p<0.01). Similar results were seen in a study by Nisa et al where 48.6% of psoriatic patients had hypertriglyceridemia as compared to 16% in controls. Study by Gisondi et al showed 37.8% of psoriatic patients were having hypertriglyceridemia as compared to 23.3% in controls. Low level of HDL was seen in 3% patients in study group and none in control group in our study. Abnormal lipid profile has also been seen in our study but these results did not reach statistical significance. Pro-inflammatory cytokines TNF-α and IL-6 are over expressed in psoriasis and known to contribute to insulin resistance. In an Italian study, 41.5% patients had diabetes in psoriasis patients as compared to 24.3% in controls (p=0.001). In a study by Nisa et al, 18% psoriatic patients were diabetic as compared to 5.3% in controls (p<0.001). Gisondi et al reported 19.2% psoriatic patients having diabetes as compared to 20.9% in controls (p>0.05). In our study, incidence of diabetes though was found to be 8.3% in psoriasis patients as compared to 3.3% in controls, but the results were not significant (p>0.05) as those in the study by Gisondi et al. 1. Schon MP, Boehncke W-H. Psoriasis. N Engl J Med. 2005; 352:1899-1912. 2. Gelfand JM, Weinstein R, Porter SB, et al. Prevalence and treatment of psoriasis in the United Kingdom: a population-based study. Arch Dermatol. 2005; 141:1537-1541. 3. Henseler T, Christophers E. Disease concomitance in psoriasis. J Am Acad Dermatol. 1995; 32:982-986. 4. Mebazaa A, El Asmi M, Zidi W, et al. Metabolic syndrome in Tunisian psoriatic patients: prevalence and determinants. J Eur Acad Dermatol Venereol. 2011; 25:705-709. 5. International Psoriasis Council. Obesity in psoriasis: the metabolic, clinical and therapeutic implications. Report of an interdisciplinary conference and review. Br J Dermatol. 2007; 157:649-655. 6. Kremers HM, McEvoy MT, Dann FJ, Gabriel SE. Heart disease in psoriasis. J Am Acad Dermatol. 2007; 57:347-354. 8. National Heart, Lung, and Blood Institute. Diagnosis and management of the metabolic syndrome: an American Heart Association/National Heart, Lung, and Blood Institute Scientific Statement. Circulation. 2005; 112:2735-2752. 9. Krueger JG, Bowcock A. Psoriasis pathophysiology: current concepts of pathogenesis. An Rheum Dis. 2005; 64 Suppl 2:ii30-ii36. 10. Hansson GK. Inflammation, atherosclerosis, and coronary artery disease. N Engl J Med. 2005; 352:1685-1695. 11. Weinberg JM. Lifestyle issues and psoriasis. Cutis. 2006; 78:160. 12. Prey S, Paul C, Bronsard V, et al. Cardiovascular risk factors in patients with plaque psoriasis: a systematic review of epidemiological studies. J Eur Acad Dermatol Venereol. 2010; 24 Suppl 2:23-30. 13. Sommer DM, Jenisch S, Suchan M, Christophers E, Weichenthal M. Increased prevalence of the metabolic syndrome in patients with moderate to severe psoriasis. Arch Dermatol Res. 2006; 298:321-328. 14. Nisa N, Qazi MA. Prevalence of metabolic syndrome in patients with psoriasis. Indian J Dermatol Venereol Leprol. 2010; 76:662-665. 15. Gisondi P, Tessari G, Conti A, et al. Prevalence of metabolic syndrome in patients with psoriasis: a hospital-based case-control study. Br J Dermatol. 2007; 157:68-73. 16. Naldi L, Parazzini F, Brevi A, et al. Family history, smoking habits, alcohol consumption and risk of psoriasis. Br J Dermatol. 1992; 127:212-217. 17. Nevitt GJ, Hutchinson PE. Psoriasis in the community: prevalence, severity and patients' beliefs and attitudes towards the disease. Br J Dermatol. 1996; 135:533-537. 18. Gerdes S, Zahl VA, Knopf H, Weichenthal M, Mrowietz U. Comedication related to comorbidities: a study in 1203 hospitalized patients with severe psoriasis. Br J Dermatol. 2008; 159:1116-1123. 19. Farber EM, Carlsen RA. Psoriasis in childhood. Calif Med. 1966; 105:415-420. 20. Buntin DM, Skinner RBJ, Rosenberg EW. Onset of psoriasis at age 108. J Am Acad Dermatol. 1983; 9:276-277. 21. Kaur I, Handa S, Kumar B. Natural history of psoriasis: a study from the Indian subcontinent. J Dermatol. 1997; 24:230-234. 22. Jayakar Thomas, Hok Kumar N Ashok, Manoharan D, Cynthia S, Lva Prabu K Selva, Hwak Ahmed N Ashwak. A study of comorbid conditions in psoriasis. J Pak Assoc Derma Oct - Dec 2009; 19(4):200-2. 23. Kimhi O, Caspi D, Bornstein NM, et al. Prevalence and risk factors of atherosclerosis in patients with psoriatic arthritis. Semin Arthritis Rheum. 2007; 36:203-209. 24. Ozturkcan S, Ermertcan AT, Sekuri C, Kylyccyoglu B. Cardiovascular findings in patients with psoriasis. Ann Saudi Med. 2006;26:159-161. 25. Kirchgessner TG, Uysal KT, Wiesbrock SM, Marino MW, Hotamisligil GS. Tumor necrosis factor-alpha contributes to obesity-related hyperleptinemia by regulating leptin release from adipocytes. J Clin Invest. 1997; 100:2777-2782. 26. Al-Mutairi N, Al-Farag S, Al-Mutairi A, Al-Shiltawy M. Comorbidities associated with psoriasis: an experience from the Middle East. J Dermatol. 2010; 37:146-155.